Today's guest review is from Poe Ghostal. 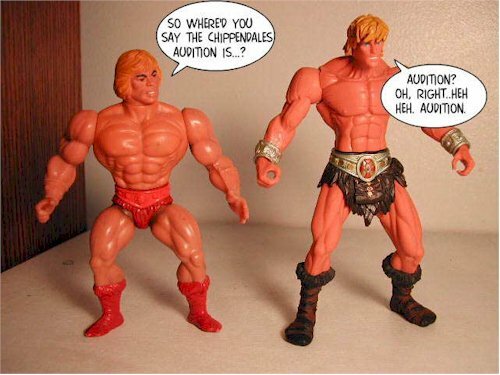 A long time He-man fan, I jumped at his offer to review the new line of redesigned He-man figures from Mattel. Take it away, Poe! Before I begin my review, please indulge me in a Harry Knowles-like preamble. I have been anticipating this line of action figures for at least a year. It was almost exactly one year ago that I stopped by the studio of the Four Horsemen design team and got a guided tour - and laid my eyes on all the He-Man prototypes, as well as dozens of concept drawings for figures that haven't even been developed yet. For anyone who hasn't heard of them, the Four Horsemen are four sculptors who once worked for McFarlane Toys. 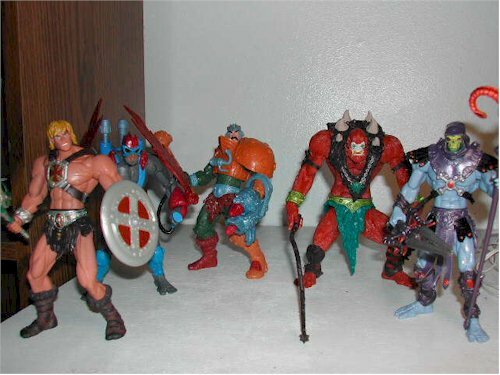 A few years ago they struck out on their own, formed the FH, and swiftly approached Mattel about the possibility of bringing back the Masters of the Universe (MOTU) toyline. This happened to coincide with Mattel's own thoughts, and soon the FH were turning their considerable design talents on remaking the beloved '80s toy line. For the record, the Four Horsemen are a great bunch of guys. They're as much fanboys as the rest of us, and fervent He-Fans to boot. They've even posted occasionally in the forums at He-Man.org, and they're always lurking there, listening to the concerns of the fans. Along with other companies like Art Asylum and Mezco, the FH represent what I hope is the future of toy creation, where fan input is taken into consideration along with corporate necessities. For me, one could almost argue that I've been anticipating this line for almost two decades. He-Man and the Masters of the Universe was for me the start of a lifelong hobby that has nurtured my imagination, fostered an interest in creative writing, and served as a fun counterbalance to the mounting responsibilities of life. I can only call such a wonderful revival of what is, for me, a fondly-remembered property can only be termed a blessing. But enough of my blather...on to the review! Reviewer's note: This review is missing one figure from the main line, Mer-Man, who is currently shipping in limited quantities due to a warehouse issue. Rest assured I will own him soon. O yes, he will be mine. What can I say...it ain't spectacular, but it's not bad. The colors are certainly evocative of the original packages, but I do miss the "drawings" of the toys on the back, rather than the pictures of them we get here. It would have been great to have the Horsemen's sketches instead of the pics. The logo on the card, btw, is a sticker than can be removed and applied to a display, a parent's valuable leather suitcase, &c.
I don't hand out many four stars, but these figures are amazing. The original figures had great colors and interesting accessories, but even as kids we could recognize the fact that they were the same molds used over and over. Thankfully the Four Horsemen used the original designs only as a guide and created their own visions of the characters. Each sculpt is faithful to the original character, yet updates them to today's standards and is a unique interpretation besides. I'm so stoked, I'll discuss each individually. Feel free to glance at those gorgeous pics while reading. 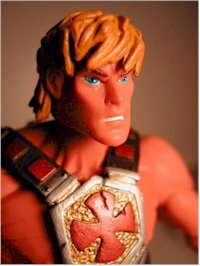 He-Man is probably the most hotly-debated new sculpt. 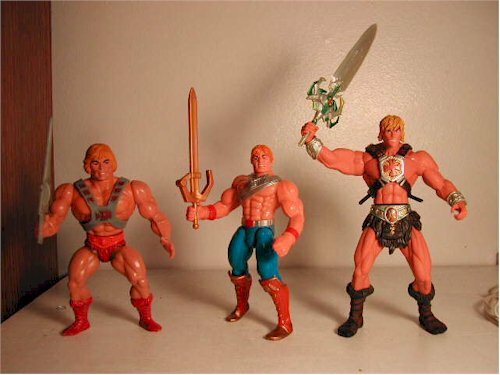 The Four Horsemen have gotten rid of the super-steroidal, semi-squatting figure of our youth and replaced him with a sleeker, more anatomically believable (but still completely jacked) He-Man. He's got his trademark furry pants but they are now ornamented with a "sporran," a Scottish invention that normally endowed a kilt and was used to carry spare change, gunpowder, and no doubt, sheepskin condoms. He-Man's head is, unfortunately, a bit plain; this is apparently the result of numerous kid focus groups. The kids preferred this look, and who are we to argue? I'm just glad they ditched the pageboy haircut. Skeletor is definitely my favorite sculpt. Here we have a Skeletor as envisioned by designers who once worked on Spawn figures. 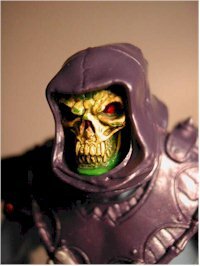 The facial sculpt, as seen above, is exquisitely detailed; Skeletor even has fangs now. The Roman-style armor, the ornamented greaves, even each individual toe has a level of detail that amazes me at this scale. 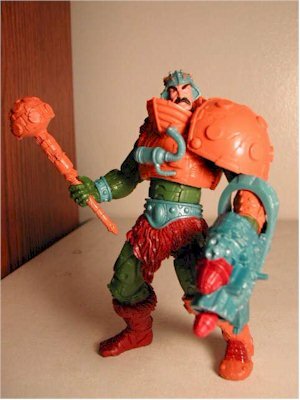 Man-At-Arms is probably the closest to Skeletor in terms of detail. Fans of the cartoon will be happy to know that we now have a MAA figure that sports a mustache. He also sports a controversial new gadget, an arm-mounted gun. The sculpt seems to indicate that Duncan's left arm and left leg are prosthetic limbs, given all the robotic details; something I find to be a fascinating concept and a cool little addition to the He-Man mythos. Stratos was always a strange figure, what with the wings and the fur, and the monkey-like face; he was like one of the Wicked Witch's flying monkeys on steroids...and with a jetpack. The FH have emphasized Stratos's simian anatomy and added all sorts of rocket-style gadgets, including two handles so Stratos can control the jetpack. Yet he remains a monkey with feathers and a jetpack. I must ask the Mother Nature of Eternia: why? Is Stratos the platypus of Eternia? I suppose only the Sorceress knows. Or maybe (for diehard He-Fans) Procrustus. 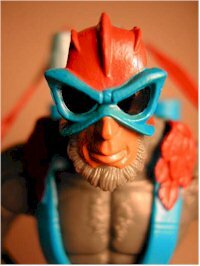 Beast Man is yet another awesome sculpt. One of the Four Horsemen (I wish I could remember which) spent days (weeks?) sculpting every little hair on his body. Beast Man has been greatly bulked up and now sports a massive hunch. Where Stratos is a monkey, Beast Man is a gorilla (or, perhaps more accurately, given that hair color and those facial hues, an orangutan). 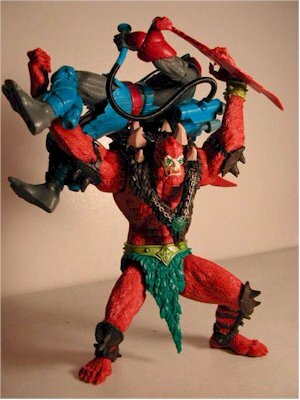 Of all the figures only Beast Man retains the classic squatting legs -probably because he's carrying most of his weight on top. 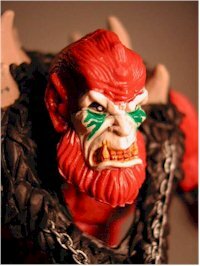 Beast Man also looks pretty pissed. If I were Skeletor, I'd think twice about badgering the new and improved BM with petty insults. For a toy line geared toward kids, the attention to detail on these paint apps is nothing short of amazing. Witness the detail on Skeletor's shin greaves, with each little jewel painted gold. Witness the green-and-yellow wash on Skull-head's hideous visage. 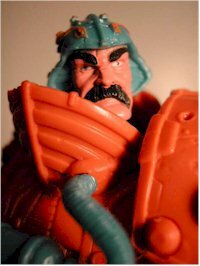 Witness the dark hairs of Man-At-Arms' mustache. Witness the blue under Beast Man's eyes. Witness! Looking closely, I see very little spilling over the edges. Great work. Okay, so they don't have the articulated ankles, elbows, or ball-joint torsos that some of us were hoping for. But they do have ball-jointed shoulders, ball-jointed hips, and cut-joint wrists, necks, and waists. Some of the figure have individualized articulation; Stratos, for example, doesn't have ball-jointed shoulders because he needs to flap his wings. His shoulders only go up and down. But to make up for this he has elbow articulation, and his "wings" also fold up and down. Similarly, the yet-to-be-seen Mer-Man has elbow articulation to facilitate his trident-jabbing ability. While I probably would have enjoyed a bit more articulation, I find they have more than enough to get them into most of the poses you might want. I'm sure the decision was made to limit the articulation so kids could play with them more easily, and I support that. Personally, I don't like action features. The little levers on the back of these toys, while fairly unobtrusive, interfere with an otherwise superb sculpt. BUT...these toys are meant for kids as much as (if not more than) collectors, so I'll review them in that spirit. The action features are good. He-Man's got his classic wind-up and punch ability; by twisting his waist and letting go, he whacks whatever's in sight. Stratos flaps his wings; Man-At-Arms bashes people with his mace when the button is pressed on his back, and the missile also fires from his gun. Skeletor waves his sword around and Beast Man waves his arms (presumably one is supposed to put an enemy in his arms, then press the button to toss the figure to the ground). While I personally never liked action features as a kid, I think many kids will love these. Truth be told, the accessories are a little hit-and-miss. Man-At-Arms' gun is a fairly normal missile-firing deal, but man, that mace has taken a beating since the '80s - it's covered with dents and scores. A nice detail. Likewise, Skeletor's Havoc Staff is no longer the impotent (and often limp) solid plastic wand of the past, but a long, straight, and highly-detailed stick that makes Saruman's rod look like a walking cane. Stratos only comes with a pair of missiles, and unfortunately my Stratos was missing one. Perhaps I can write to Mattel and get a replacement missile. 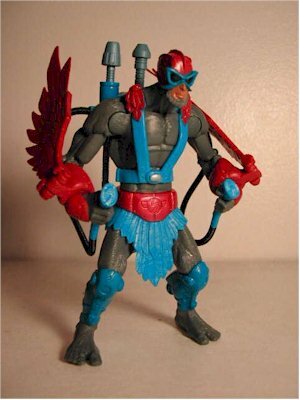 Beast-Man comes with his trademark whip - which actually looks like a whip this time, rather than half a jump rope. He-Man comes with a technologically-advanced-looking axe and a rather simple shield. He also comes with the Power Sword, which has morphed into a techno-looking geegaw. Now, permit me digress again. The truth shall be told: the Four Horsemen didn't originally plan for the sword He-Man comes with to be the Power Sword. Rather, the twin-bladed sword Skeletor is carrying was their version of the Power Sword. In the original mythos of MOTU (way back in the early comics, before the cartoon came along), there were two Power Swords, an "evil" one and a "good" one. 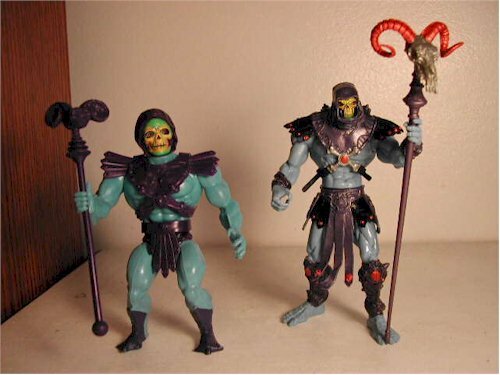 Skeletor had the evil one and was always trying to get the good one, which was possessed by - you guessed it - He-Man. 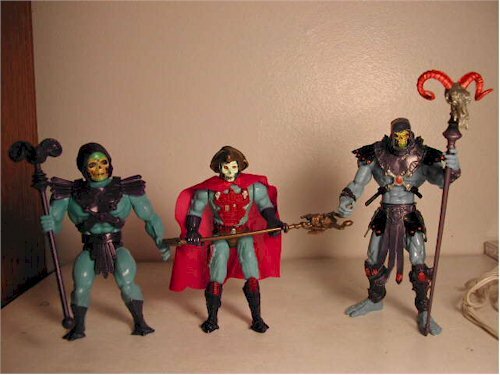 For the revamp, the Four Horsemen envisioned an Eternia where the good guys were on the defensive: Skeletor had captured both halves of the Power Sword and was slowly conquering the world. To fight back, Man-At-Arms used his scientific skills to create a technologically-advanced sword that was then magically enchanted by the Sorceress. The weapon could trigger Adam's change into He-Man and aid in the fight against Skeletor. Ultimately, however, I suspect the Four Horsemen figured He-Man would wrest at least his half of the "real" Power Sword back from Skeletor. In any event, Mattel (and the kid focus groups) liked the "Techno-sword" so much they decided to make it the "real" Power Sword, leaving Skeletor with an unexplained but fascinating twin-bladed sword. The detail on this weapon is fantastic - one side looks like an eagle's wings (the "good" side) while the other looks like the horns of the Havoc Staff (the "evil" side, obviously). It can split into two swords (there's a trick to fitting it into his hand - take them apart, slide one handle into his hand, then snap them back together again). By comparison, the Techno-sword is just a tad dull, in my opinion. The hilt rotates, which is apparently part of the process by which Prince Adam turns into He-Man. He-Man's sword and axe seem to be made from slightly cheaper plastic than most of the other weapons - no idea why. To answer a potential question, yes, the armor comes off just like in the old days. Even the "hair" over Beast Man's shoulders comes off. I think only Stratos has non-removable armor. 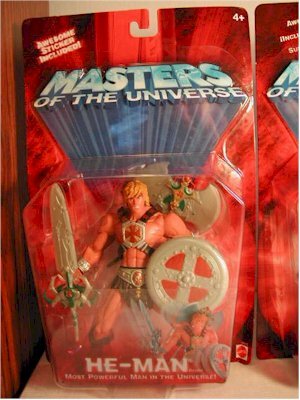 There has been a bit of controversy over He-Man's armor - it seems the red "Iron Cross" from the original armor was found a little too non-politically-correct by Mattel. Several thousand cross He-Man were produced; but in a running change, the cross was replaced with a rather odd H-symbol with a bar through it (on the toy, it looks more like an asterisk). This makes the cross He-Man (seen here) a variant, but he's a relatively common variant. If you really want a cross He-Man, you shouldn't have too much trouble locating one for a fairly reasonable price on eBay. Overall, however, each figure is complemented by at least one appropriate, highly-detailed and interesting accessory. The quality of a figure's plastic has become a big issue for me in these days of EasyBreak McFarlane figures and whatnot. Of course, these figures are designed to be played with by children, so they're fairly solid. No, they're not as durable as the old figures - you could slam those against a wall all day and they wouldn't show a dent. I should know; throwing figures against the wall for hours was an entertaining activity when I was a three-year-old. Actually I suppose it would be entertaining now, too, but I have a security deposit on my apartment and I don't want to have to explain why there's a tiny human arm stuck in the plaster. But I've digressed yet again - at least these figures, unlike their predecessors, have actual hip joints, and not a little rubber band that would weaken after an hour of play, never allowing the toy to stand on its own two feet ever again. Some of the weapons, as mentioned above, aren't completely solid - my He-Man's sword, for example, is made of such weak plastic that the bottom parts are a little bent. But overall the figures are constructed of sturdy plastic. I'd pay any price for these, natch, but their ARP is $7.99. That's pretty reasonable for the size of the figure and the average amount of accessories. But I suggest avoiding the comic shops. I wanted mine early, but these will be flooding the brick-and-mortar stores by the end of July. This seems like the best place to mention that each figure comes with a two-year warranty(!). So go ahead and throw it against the wall if you want to. Just don't mention that when you ask for a replacement figure. Actually, I don't want to seen as advocating fraud, so don't throw it against the wall with the intention of cashing in on the warranty, okay? Thanks. And thus I end this, my masterpiece in the genre of toy reviewing. Thank you, Four Horsemen, and thank you, Mattel, for bringing my childhood back to me in such stunning form. Am I a biased reviewer? Yes. But I'm also an unforgivingly pessimistic and cynical one, and if these figures had failed to meet my expectations, I would have grudgingly admitted it. As it is, I am pleasantly surprised by just how sublime these toys are. Yes, I just called some toys sublime. If you're bound and determined to get these online, I recommend Toybliss.com, where at last check they were selling these for the weirdly low price of $6.99. But Toybliss doesn't have the villains; try Entertainment Earth (MROTW Affiliate) and BigBadToyStore for those. Toysrus.com (MROTW Affiliate) has them for pre-order at $9.99 apiece, but again, I recommend waiting a few weeks and scoring them all at your local Wal-Mart or TRU.